Optical fibers carry data in the form of pulses of light over distances of thousands of miles at amazing speeds. They are one of the glories of modern telecommunications technology. However, their capacity is limited, because the pulses of light need to be lined up one after the other in the fiber with a minimum distance between them so the signals don’t interfere with each other. This leaves unused empty space for data in the fiber. EPFL’s Camille Brès and Luc Thévenaz have come up with a method for fitting pulses together within the fibers, thereby reducing the space between pulses. Their approach, which has been published in Nature Communications, makes it possible to use all the capacity in an optical fiber. This opens the door to a ten-fold increase in throughput in our telecommunications systems. Simply put, an “on” pulse corresponds to the number 1, while an “off” pulse corresponds to 0. The messages are thus sets of ones and zeros. These codes are decoded by the receiver, providing the initial message. The problem with this system is that the volume of data transmitted at one time can’t be increased. If the pulses get too close together, they no longer deliver the data reliably. “There needs to be a certain distance between each pulse, so they don’t interfere with each other,” says Luc Thevenaz, of EPFL’s Fiber Optics Group (GFO). However, the EPFL team noticed that changes in the shape of the pulses could limit the interference. 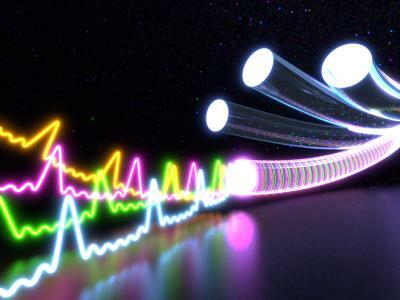 The idea of putting pulses together like a puzzle to boost optic fibers’ throughput isn’t new. However, the “puzzle” had never been “solved” before: despite attempts using sophisticated and costly infrastructures, nobody had managed to make it work accurately enough – until now. The EPFL team used a simple laser and modulator to generate a pulse that is more than 99% perfect. Practically speaking, the shape of pulse is determined by its spectrum. In this case, in order to be able to generate the “jigsaw puzzle,” the spectrum needs to be rectangular. This means that all the frequencies in the pulse need to be of the same intensity. Professors Brès and Thévenaz had this in mind when modulating their lasers. Simple lasers are generally made up essentially of just one color – i.e., one optical frequency – with a very narrow spectrum. This is rather like a violin that has only one string. However, a laser can be subtly modulated (using a device called a modulator) so that it has other colors/frequencies. The result is a pulse composed of several different colors, with a larger spectrum. The problem is that the pulse’s main color generally still tends to be more intense than the others. This means the spectrum won’t have the rectangular shape needed. For that, each color in the pulse needs to be of the same intensity, rather like getting the strings of a violin to vibrate with the same force, but without making any other strings nearby vibrate. The new pulses could well generate interest among many telecommunications-industry market participants. The technology is already mature, as well as 100% optic and relatively cheap. In addition, it appears that it could fit on a simple chip. “It almost seems too good to be true,” says Prof. Thévenaz. April 16, 2019 - 3M fiber-optic connectors can accommodate from 12 to 192 fibers Laser Focus WorldThe Expanded Beam Optical Connector System is a scalable single-mode and multimode interconnect system for datacenter applications. April 20, 2019 - Military Fiber Optic Connectors Market Business Oppourtunity, Investment, Technology Trends and Future Prospects to 2025 AppWebRadarA research report on 'Military Fiber Optic Connectors Market' compiled by Market Study Report, LLC, features a succinct analysis on the latest market trends. April 17, 2019 - San Diego Company Promises Faster Data With Cables Made on International Space Station NBC 7 San DiegoA San Diego company's dreams are literally soaring into space Wednesday as their fiber optic product launches for a stint on the International Space Station. April 13, 2019 - Quest for high-speed internet: Fiber optic close but out of reach for Valley business Sunbury Daily ItemLEWISBURG — It is approximately 55 steps from the front door of CVC Mechanical Contractors Inc., across the parking lot, to the nearest *service* pole.